Rangemaster professional, Kitchener 90 fascia panel sticker set. 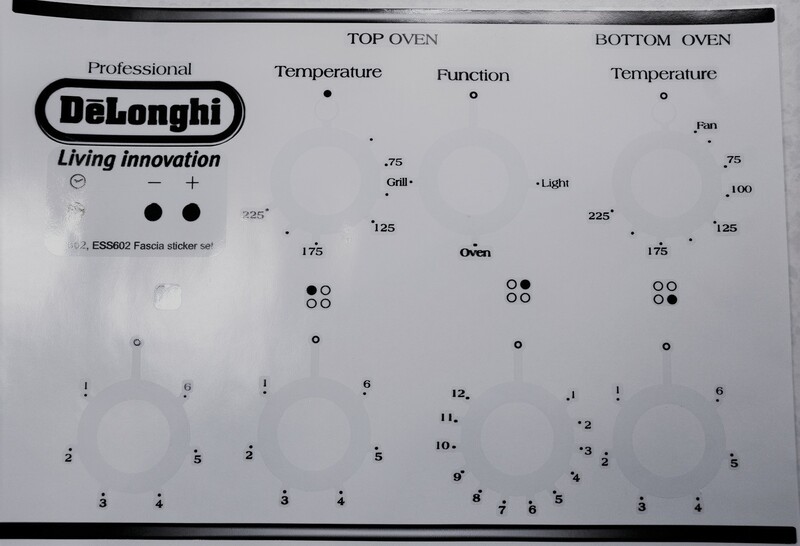 Delonghi ESI602, ESS602 front panel fascia sticker set. Home Appliance decal stickers. 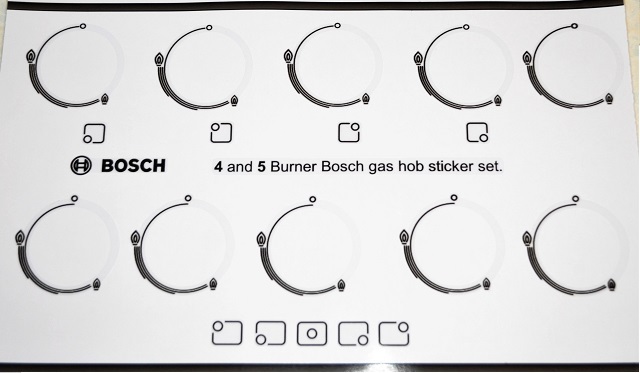 Bosch Bosch 4 and 5 gas burner hob sticker set for worn markings. Bosch 4 and 5 gas burner hob sticker set for worn markings. Bosch 4 and 5 gas burner sticker set for worn markings, may suit other models. Clear vinyl stickers with print in black so fairly bold, only about 5mm width, so take care when fitting, strong vinyl. Simply clean off all remnants of old, remove dial then peel and stick to clean dry surface. Made for 35 to 37mm dials. Two variations on the sheet with zero above and inline, see image. Will be cut in to sections for posting. Bosch PCS7A5B90 5 burner hob stickers. Bosch HBN531E0B decal sticker set for worn fronts. Bosch HBN210250E decal sticker set for worn fronts. Bosch HBN331EOB and HBN331E5B front panel decal sticker set. Bosch HBN230 2.0 E decal sticker set for worn fronts. 6 x Bosch emblem stickers, inverted for black.